Ich habe vor einiger Zeit ja schonmal von einem BattleTech-Produkt gesprochen, das endlich wieder einen Schritt vorwärts gemacht hat. Vielleicht habe ich auch vergessen zu erwähnen, dass es sich dabei um BattleTech handelt. In the wake of the Word of Blake Jihad, the Republic of the Sphere has emerged from the ashes, promising hope and salvation to a universe ravaged by horror and warfare. But not everyone is ready to lay down their arms just yet, and some of the deadliest renegades remain at large, having reveled in the chaos of the Blakist holocaust. Armed with cutting-edge ’Mechs, vehicles, and battle armor—modified with whatever experimental technology they have managed to capture or steal—these criminals represent a clear and present danger to the Republic and its people! Experimental Tech Readout: Most Wanted samples custom machines that have appeared in the BattleTech universe since the days of the Jihad. Each unit featured in this book incorporates some of the latest technologies developed by the realms of the Inner Sphere in their war against the Word of Blake, as first described in Tactical Operations—deployed now by some of the Inner Sphere’s most dangerous criminals. 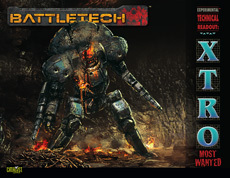 Statistics and Record Sheets are included for 13 new experimental BattleMechs, vehicles, and aerospace and battle armor units, ready for play in advanced BattleTech games. Ein Datum gibt es noch nicht, aber das macht ja nichts. Das Artwork wird übrigens vom großartigen Matt Plog kommen.